Ronald Sebuguzi and Zambia's Muna Singh Jr top SSS1 with the fastest time. Ronald Sebuguzi and Zambia’s Muna Singh Jr top SSS1 with the fastest time. The two crews tied at 2minutes, 20seconds. Meanwhile, Tufail Amin from Tanzania suffers the first blow of the event after he rolled on his first run. However the crew is working to get the car back to race. 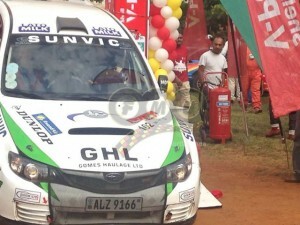 Previous Article VPower Pearl of Africa Uganda Rally Flags Off ! !